The visit brought to mind a near-disaster of a do-it-yourself project of mine several years ago -not so funny at the time- but hilarious in retrospect. At the time, I imagined Larry David's character in a similar situation and went to the trouble of writing a "story idea" outline that has moldered away on a computer disk somewhere in my closet. 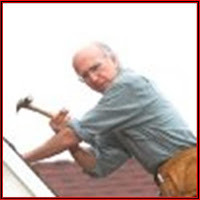 Of course, on Curb, Larry poses as a guy who would not know which end of a screwdriver to hold, which makes my idea funny - particularly since Larry, in his perverse way in my story, ends up doing better than an expert carpenter. It is well known that Larry David doesn't accept story ideas from the general public. (And for good reason. If he even looked at an idea and later happened to do something similar on a future show, he could get sued for plagiarism.) Never-the-less, I fantasize about running into him and telling him about my story idea and perhaps pressing a copy of my outline into his hands. Perhaps you have fantasized in the same way. Every time I think about my "fantasy episode" of Curb it gives me joy and satisfaction. It plays out in my mind and I would be happy to give it away free -and even with no on-screen credit- if I could only see it used and, of course, perfected by Larry! I imagine myself being invited to be a technical advisor on how my do-it-yourself project crashed and even playing one of the characters. YES, I would do it all for free, but I hope they would pay my actual expenses. I've never been into "fantasy football" where fans compose teams of current players and games are played out in computer simulation for the mutual enjoyment of other fans. However, I think there is a market for "fantasy episodes" of Curb (and Seinfeld of course) where fans compose stories with existing and new characters and play them out for the mutual enjoyment of other fans. This Blog is my contribution to that genre. I also welcome YOUR fantasy episodes. Please send them to me via email: Ira@techie.com. (In your email, please make it clear you intend to place your work into the public domain and you release everyone from any obligation to credit or compensate you for your efforts.) If I like your work, I will have Google Blogger send you an invitation to become an Author on this Blog and you will be able to post your fantasy episode for others to enjoy and, via the comment thread, discuss with you. Who knows, perhaps Larry, by chance ("great minds think alike") will use some idea you or I came up with and we will be able to point to our time-stamped posting in this Blog and say "I thought of that first!" Let the fantasy episodes begin!